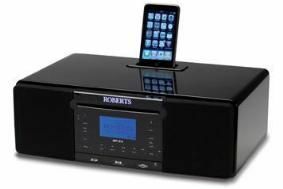 Roberts adds web radio to combi DAB/iPod dock/CD player | What Hi-Fi? Its acoustically-tuned wooden cabinet is finished in gloss black, it can record from the radio or CD to an SD card or USB stick, and will stream music from your computer via wi-fi. You get separate bass and treble controls, seven-position graphic equaliser and large, touch-panel controls, an aux input for MP3 playback, plus a clock and dual alarm for weekdays and weekends. Compatibility with Last.fm is included, the system recommending music you might like based on what you're already listening too. As for connectivity, there's a stereo line out, stereo headphone socket, optical digital out and AC adapter. Playback from USB is compatible with MP3, WMA, AAC and FLAC files.